​Fr. Tom Fangman has served in the Archdiocese of Omaha as a parish priest since his ordination. 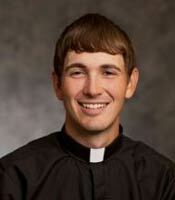 A native of Omaha, ​he attended Christ the King, Creighton Prep and graduated from Kansas University. Then he attended Kenrick-Glennon Seminary in St. Louis where he earned two Master’s degrees: Counseling and Theology. Father Tom was ordained a priest in 1992 by Archbishop Daniel Sheehan and his first assignment was at St. Philip Neri in north Omaha. Next he became Associate Pastor of Sacred Heart Church in Norfolk, Nebraska where he was also a Theology teacher at Norfolk Catholic. 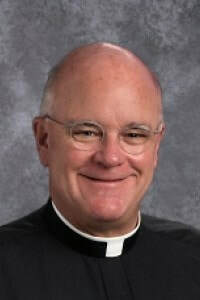 Father Tom became Pastor of Sacred Heart Church in Omaha in 1998. In 2016, he joined St. Patrick's Parish as its Pastor. ​​Deacon Bud Simmonds and his family have attended St. Patrick’s since the mid 1980’s. He and his wife, Barbara, raised six children, four girls, two boys, and approximately seventy foster children. Their own kids have seven children and his oldest grandson recently had a son making Bud a great grandfather. Bud was ordained to the Permanent Diaconate in 2008 assigned to St. Patrick’s, and joined the staff in 2013. He is involved in a variety of ministries: Adult Faith Formation, Cemetery Sexton, serving at the altar for daily and weekend Masses, helping to teach students in the RF program, mentoring Confirmation candidates, taking communion to the home-bound, conducting communion services at nursing care facilities, baptizing babies, and helping Fr. Tom and Fr. John with marriage preparation for couples seeking the Sacrament of Marriage. Bud feels that he lives a full, busy, blessed life, for sure. Deacon John is new to St. Patrick’s and you may have noticed him on the Altar the past couple of weeks. Deacon John R. Jacobs was ordained to the Permanent Diaconate in June 2013 in the Archdiocese of Mobile, Alabama and assigned to minister at the Church of the Holy Spirit in Montgomery, Alabama. He has been married to Karen for 44 years. John is retired from the U.S. Air Force and Alabama Department of Corrections. Karen is retired from the Civil Air Patrol Headquarters. They have two children and recently moved to Elkhorn to help care for their three grandchildren. Their son is a civil engineer and daughter-in-law is a registered nurse. The family resides in Omaha. Another daughter is also a registered nurse and still resides in Birmingham, Alabama. 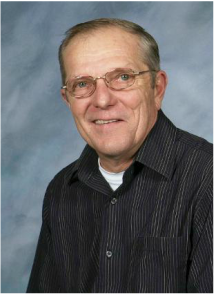 John will be assisting the pastor at liturgical services, administrating the sacraments and ministering to hospital patients, nursing home residents, and the home-bound. 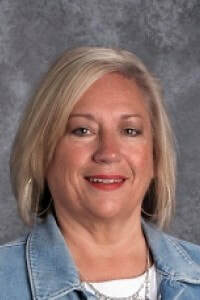 ​Vicki Payton joined St. Pat’s staff in April, 2007 as the Business Manager. Prior to St. Patrick’s, she worked in the insurance, manufacturing and delivery industries, performing various roles including management, accounting, customer service, scheduling and dispatching. 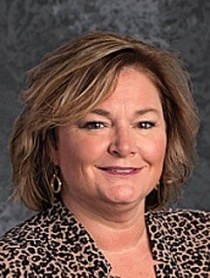 As Business Manager for St. Patrick’s, Vicki is responsible for the church and school’s finances and human resources. This includes budget preparation and management of funds. She reports the parish and school finances to the Finance Committee and parishioners. Vicki manages payroll, insurance and other human resource responsibilities for over 100 St. Patrick’s employees. She also assists with facility management, and capital campaigns along with other duties. A parishioner of St. Patrick’s, Vicki and her husband, Jeff, volunteer at various events within the parish, and try to take advantage of the multitude of available offerings the parish has available. Vicki enjoys spending time with her children and grandchildren. She also occupies her time with gardening, quilting and riding with her husband on his motorcycle. Mary McMahon grew up on a farm outside of Neola, Iowa. She moved to Nebraska when she married her husband, Mike. They have two grown children, Megan and Nicholas, both married. They are blessed to have four grandsons; Dillon, Mike, Tyler and Colton. Mary and Mike joined St. Patrick’s in 1980 and prior to becoming the Director of Religious Formation, she volunteered as a catechist, helped with special projects and also volunteered in the RF Office. Over the years, she worked with several DRE’s who in a way were mentoring her all along. Each time the opening for a new Director of Religious Formation came up, she considered the possibility of applying, but at the time, knew the hours would not work for her family. In 1999, St. Patrick's DRE was relocating and encouraged Mary to apply for the position. She was hired to work in a program that has always been near and dear to her heart. Her position allows her to plan, organize and pass on the Catholic faith. Mary feels that it is truly rewarding to work with the children, parents and volunteers in our parish community. 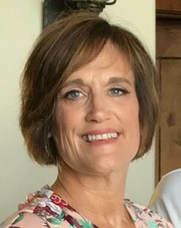 Anna Kolterman grew up in Blair, NE, graduated from Marian High School as well as nursing school at Creighton University. In high school and college, she was an enthusiastic singer at Sacred Heart Church and it is there that she began planning music for liturgies and where she met her dear friend, Fr. Tom Fangman. She continued her education in music liturgy as she began her nursing career, planning and coordinating liturgies in the cities of Pittsburgh and San Diego. Finally, she came back to Omaha. At Christ the King Church, she later accepted a position as director of music liturgy. She completed 14 years of service there. Anna married her husband, Shawn and together they are raising their 5 beautiful daughters; Juliet, and Cecilia, who attend Marian High School, and Eleanor, Marielle, and Francesca who attend St. Cecilia Elementary School. Anna no longer work as a NICU nurse. She has been blessed to work with kids of all ages at Christ the King and Marian High School where she has worked as the liturgist and worship choir director in their campus ministry department for the last 6 years. Anna feels that is wonderful to be a part of this musical parish, full of singing people of all ages! She gives thanks to God who has led her to St. Patrick’s to be a part of the community and with a grateful heart, she looks forward to many life-giving liturgies with all! Jessica has been a parishioner for over 18 years when she and Bill were married here! Jessica's family has been active in the parish community for many years (since 1976!) . Jessica has two children who have attended St. Patrick's, Paige and Trey. Over the years Jessica has done Development work for Marian High School and corporate recruiting. She has a love of music, a degree in theater and a passion for helping others find their place at St. Patrick's. This all adds up to one busy lady who loves to plan gatherings and help others! My name is Adam Stephenson and I'm originally from Gypsum, Kansas. My wife Rachael and I moved to Omaha 6 years ago to follow my career as a Sports Performance Coach and hers as a teacher, now an administrator. We are members of St Charles Borromeo in Gretna and have 4 kids that are constantly attached to our hips! Over the years I've enjoyed many hobbies, but found that they would inevitably lead to boredom, an unfulfilled feeling, or lack true meaning. Over the last few years my hobby has been Jesus. He's been the only thing in my life (along with my family) that has negated the previous roadblocks. I'm excited for the opportunity to help others realize that this opportunity is very real and of utmost importance in their lives as it has been in mine. Nick grew up in rural south central Nebraska near Alexandria. His father owns and operates a farming and ranching business for over 35 years. His mother has been an elementary school teacher for over 30 years. Nick has always enjoyed working on the farm and with livestock in his free time. He has one sister and has two younger brothers. Nick graduated from Bruning Public Schools in Nebraska. 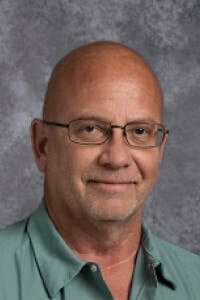 He received his Bachelors in Education from the University of Nebraska at Kearney with an endorsement in K-12 physical education/health and social studies. He then continued his education attaining a Masters in Administration from the University of Nebraska at Kearney. 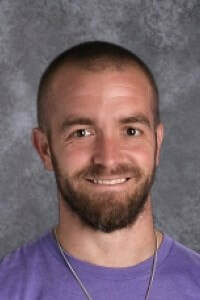 His experience includes teaching at Sandhills Public, Superior Public and Santee Community Schools. Coaching football, basketball and track and working with students in this environment proved to be a rewarding experience for him. 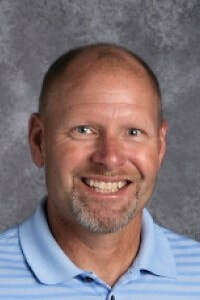 Nick also served as the acting athletic director at Santee Community Schools. He enjoyed his time at each facility, learned many valuable lessons about being an educator and made many lifelong friends. Nick is honored to have this opportunity to be a part of the St. Patrick’s School’s family and community. He believes a Catholic school develops a school culture of intellectual, spiritual, and personal development. Lisa moved to Omaha in 1986 from LeMars, Iowa to pursue a career in Accounting. She provides accounting services for a client two days a week and the rest of the week, she works part-time in the parish business office. Lisa also serves as St. Patrick’s Safe Environment Coordinator. Her family includes her husband, Mike, and her two daughters, Hannah and Chloe. They joined St. Patrick’s parish in 2002. her daughters are both St. Patrick’s School graduates.